Iraq's military has cast doubt on reports that an air strike by the US-led coalition caused the deaths of dozens of civilians in west Mosul. Instead it blamed explosive booby-traps set by so-called Islamic State (IS). The US said on Saturday that it was investigating an air strike on 17 March at "the location corresponding to allegations of civilian casualties". 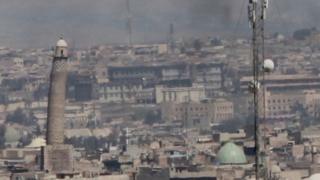 The Iraqi government offensive to drive IS from west Mosul continued on Sunday with helicopter gunships in action. 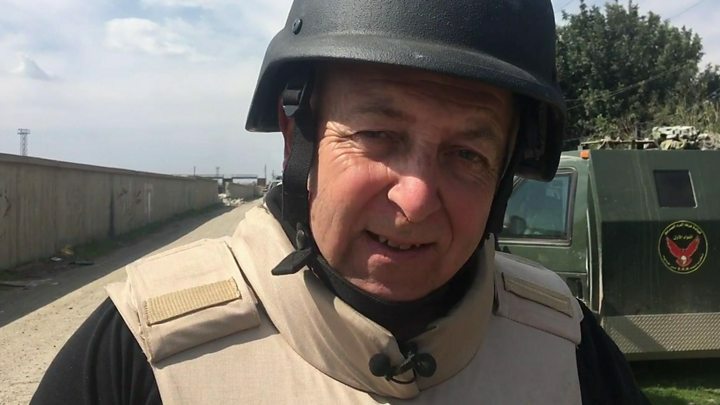 "Ignore reports Iraq forces have paused Mosul offensive," the BBC's Jeremy Bowen tweeted from Mosul. "It continues. Have seen gunships firing and heard much activity in the last few hours." Reports suggested the disputed air strike, or strikes, killed more than 100 people in the Jadideh neighbourhood. But the details, and even the exact date, remain sketchy. Some reports suggested more than 200 bodies were pulled from a collapsed building. However, the Iraqi military, on its Facebook page, has issued a detailed rebuttal of claims that an air strike was behind the deaths. The statement names al-Resala neighbourhood rather than Jadideh. It says the coalition carried out an air strike, at the request of Iraqi forces, at 08:25 local time on 17 March. Iraqi military experts checked a house "reportedly targeted by an air strike and they found out that the house was completely destroyed and there was no sign that it was destroyed by a strike". The Iraqi statement goes on: "A huge detonated booby-trapped vehicle was found near the house. Some 61 dead bodies were pulled from under the rubble." The military says eyewitnesses described how IS used houses, rigged with explosives and containing families, from which to fire at security forces. In its statement on Saturday, the US Central Command said "an initial review of strike data" indicated that an air strike on 17 March was carried out in west Mosul "at the location corresponding to allegations of civilian casualties". The coalition "takes all allegations of civilian casualties seriously and a formal Civilian Casualty Credibility Assessment has been opened to determine the facts surrounding the strike", it went on. The battle is now centering on the Old City as Iraqi forces try to push IS from west Mosul. The jihadists were ejected from east Mosul in January after a months-long offensive.